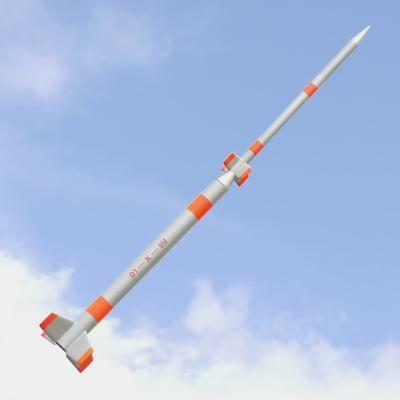 The Kappa 9M is a two - stage Japanese sounding rocket. The first Kappa 9M (K - 9M - 1) was flown on November 12, 1962. 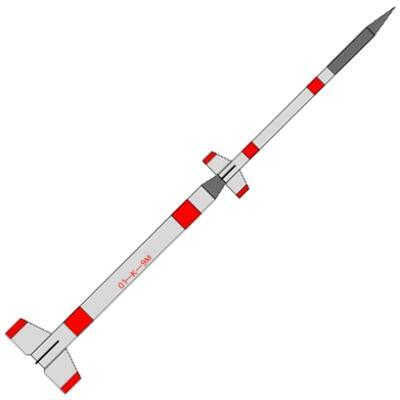 This newly updated single-stage scale model features laser-cut basswood fins, balsa nose cone, balsa transition, quick-change engine hook and decals. Instructions have been totally updated and rewritten as well! This is a sharp looking model that's also fairly easy to build. Adhesives (Wood glue, such as Elmer’s Carpenters Glue, can be used throughout and is recommended for most construction. Other adhesives [epoxy, cyanoacrylate, etc.] may be used if you are familiar with their use and prefer them. ); Hobby Knife with sharp #11 Blade; Ruler; Pencil; Masking Tape; Sandpapers (Medium - 180 or 220, Fine 320 or 400, & [optionally] Extra-Fine - 500 or 600); Sanding Sealer (or other balsa filler coat); Thinner (appropriate for the type of sanding sealer used); Small Paint Brush (to apply sealer); Spray Paint (such as Testors or Krylon is recommended, do not mix brands/types without testing) - Primer (optional, but recommended), White (optional, but recommended), Aluminum, Steel (note: silver may be used in place of the aluminum and steel, see Step # 14), Fluorescent Red and (optionally) Clear (flat clear preferred). Optional: Material to fill body tube seams and/or any imperfections in wood parts, such as Elmer’s Carpenters Wood Filler, Interior Spackling Paste, etc. ; decal setting or solvent solution (such as Solv-A-Set or Super Set).